For the poet, the task of genealogy is not a new one; see Beowulf; even Exodus. 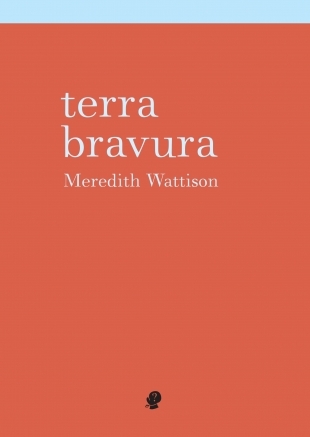 Meredith Wattison’s terra bravura, however, is a personal-historical genealogy that covers and recovers the intersecting scapes forging modern Australia, from cultural and individual inheritance and exile to colonialism, filial duty, and motherhood. Each trope takes part in, as it takes apart, the construction of the self—that recognition of the unknowable kindred amid the clashing horrors and passions of the past…The bravura is in the telling. rough sutured with failed fences…(11). (from “Contemplations,” quoted in Wilson). Like Bradstreet, Wattison is singularly searching, in pursuit as much as pursued by narrative. is tied to the anguished other (17). Mestra with fair tresses, who shone like the Charites. named after the strong burning famine. …………………………………………..of women [ (Rutherford, 104). The mother is omitted in the ehoie that begins the Aspis (= fr. 195), where we have the patronymic “son of Electryon”, and also in fr. 58.7. Both mother and father are, however, specified in fr. 26.5ff (footnote 22). Gender always factors in ehoie-poetry. It signifies in Wattison’s genealogy: how names are omitted, relationships highlighted; the latter become a kinship lattice, in this instance among women. The notion of the fragment is also brought to the fore, where names and direct orders of lineage go unremembered, perhaps now unknowable. In his analysis of Hesiod, Rutherford admits the haziness of time and retelling when dealing with ancient and partial texts: “These lines probably describe Sisyphus acquiring Mestra for his son, though, depending on how we reconstruct the papyrus, it is possible that this is a previous wedding” (Rutherford, 105). A change in word, an omission, can alter the meaning. In terra bravura, ellipses and elapses between century-long decades are compensated for through their relations, even “when cramping against the trompe l’oeil of women” (33). of a dying wave’s evanescence (89). To the apparent linearity, unidirectionality and irreversibility of time, we can counterpose the multiplicity of places, planes and practices. And in each of these spaces, repertoires of conduct are activated that are not bounded by the enclosure formed by the human skin or carried in a stable form in the interior of an individual: they are rather webs of tension across a space that accord human beings capacities and powers to the extent that they catch them up in hybrid assemblages of knowledges, instruments, vocabularies, systems of judgement and technical artefacts (Rose, 324). Like The Years […] The Waves explores the possibilities of change and continuity in history through individual lives. Both novels flirt with formal structures based on historical reflexivity: The Waves (which is divided into sections based on the natural rhythms of the sun moving though the sky and the waves striking a beach) and The Years (structured as a series of chapters with year headings) are modeled on two opposing historical assumptions (ibid.). Wattison’s genealogy refuses to confer this modernist duality; aware of the binary thought of such logic, the poems of terra bravura counter formal paradigms just as they refuse form, chronology, even titling. But as for Woolf’s “change and continuity in history through individual lives,” this terra bravura embraces. Like the returning image of the black swan, Wattison has found a creature of (European) imagination, made real by the expanding circles of colonial encounter: the surprise of Cygnus atratus to the unaccustomed eye; once of monotypic genus, Chenopis, now assimilated as much into the Linnaean as we readers into its environ—language-corpus. At the last, this book is threnodic homage; some utterance found at the center of what constitutes this made self. Wattison is returned by way of the last two poems (one prose, one epistolary) to the literality of her father’s recession into dementia. My father will not use the visor to check the glare. He holds his hand up like a Biblical gesture, an exaggeration, a mime, the coming of a plague. I tilt the visor for him. It ceases to be Biblical (127). As a group they have the mien of horses. of father’s English and glare (46). To meet with level gaze the departure of this horizon at the point of its arrival…I told you, bravura is this telling. Darragh, Tina. Striking Resemblance: Work, 1980-1986. Providence: Burning Deck, 1989. Goyal, Rishi and Rita Charon. “In Waves of Time, Space, and Self: The Dwelling-Place of Age in Virginia Woolf’s The Waves.” Storying Later Life: Issues, Investigations, and Interventions in Narrative Gerontology. Eds. Gary Kenyon, Ernst Bohlmeijer, and William L. Randall. Oxford: Oxford University Press, 2011. Rose, Nikolas. “Identity, Genealogy, History.” Identity: a reader. Eds. Paul du Gay, Jessica Evans, and Peter Redman. London: SAGE, 2000. Reprint, 2005. Rutherford, Ian. “Mestra at Athens: Hesiod fr. 43 and the poetics of panhellenism.”The Hesiod Catalogue of Women: Constructions and Reconstructions. Ed. Richard Hunter. Cambridge: Cambridge University Press, 2005. Wattison, Meredith. terra bravura. Glebe: Puncher & Wattmann, 2015. Wilson, Rob. “‘Enrapted Senses’: Anne Bradstreet’s ‘Contemplations.’” American Sublime: The Genealogy of a Poetic Genre. Madison: University of Wisconsin Press, 1991. This entry was posted in Edric Mesmer, Issue 14, Meredith Wattison, Puncher & Wattmann and tagged Australian poetry, poetry, Yellow Field by Mark Roberts. Bookmark the permalink.